It used to be that mascara was just some black paint with a brush, but every year brands are coming up with new technology to make your mascara do more. And 2015 seems to the year of the boldest promises yet, from formulas that are said extend your lashes with fibers (more on that later) to those that come with conditioner. If there's one product I can't live without, it's mascara. There's something about that extra flirty flick that gives me a boost. 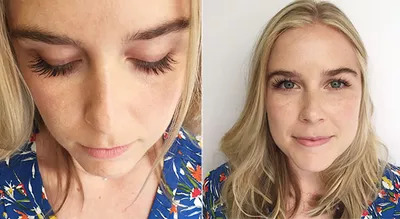 While I love the length of my natural lashes, I am also not ashamed to admit to a totally healthy obsession with trying to make them look as full and long as I possibly can. It used to be that mascara was just some black pigment with a brush, but every year brands are coming up with new technology to make your mascara do more. And 2015 seems to the year of the boldest promises yet, from formulas that are said to extend your lashes with fibers (more on that later) to those that come with conditioner. But do they really work? 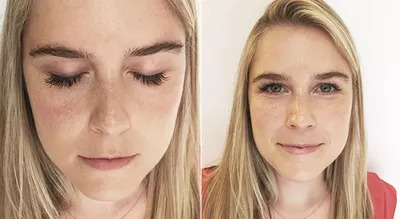 I decided to put my mascara expertise to the test and try out three of the latest magic wands to hit the shelves. See for yourself. Here are my natural lashes, no mascara at all. Throughout the test, I applied mascara only to my right eye (your left), so you can really see the comparison. Putting fibers in hair products to create more volume is nothing new, so why not add fibers to your lashes? Along with the mascara, this kit comes with what I'll just call a "fiber thingy" (scientific, I know) that allows you to coat your lashes in these little hairs. You first apply the mascara, then the "extensions" (with your fiber thingy), then the mascara again to lock everything in. You can repeat the process until you're happy with the results. The fibers made my lashes look extra full and dark for an almost fake look. The only real downside is that the fibers fall all over your face when applying them to your lashes. To prevent having to redo your makeup, be sure to hold a tissue under your eyes while applying or apply the mascara before your foundation and concealer so you can just wipe away the remains with a wet washcloth. Stealing another idea from your hair routine is this this new Rimmel mascara that comes with a conditioner, which is basically an oil that helps strengthen and nourish lashes to prevent breakage. 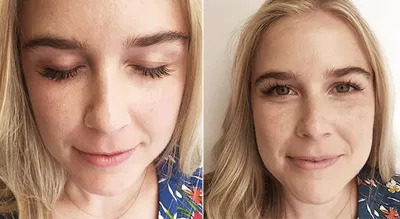 There are separate lash conditioners or even a prescription-strength remedy, Latisse, that promise the same thing, but that's why this product is pretty brilliant: you get two-for-one! The Wonderlash Mascara contains argan oil to create a smooth application and to moisturize lashes throughout the day. I didn't notice a major change in the strength or length of my natural lashes, but the formula did go on super smooth. The brush is big and flexible so you can get a lot of mileage out of just one stroke. I hate clumpy lashes so I love how this one spread them all out, nice and evenly. The formula was also very light and didn't look caked on like other mascaras. It's perfect for a natural look. Don't let the sea urchin looking tip scare you— it may be small but it is mighty! If you like taking your time to make sure every single lash is coated and in its place, then this is the mascara for you. The rounded ball brush allowed me to get in every nook and cranny to lift and separate every last lash. The problem? It took some time to get my lashes fully coated due to the small brush. But when you have the time, this one won't disappoint. Whether you like your lashes to be thick and full or thin and separated, this wand lets you customize to your preference.